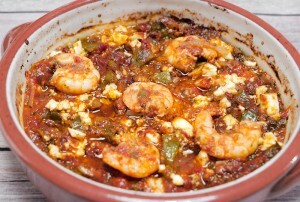 A fast but delicious Greek appetizer with shrimps in tomato sauce topped with Feta. It’s the famous Garides Saganaki. 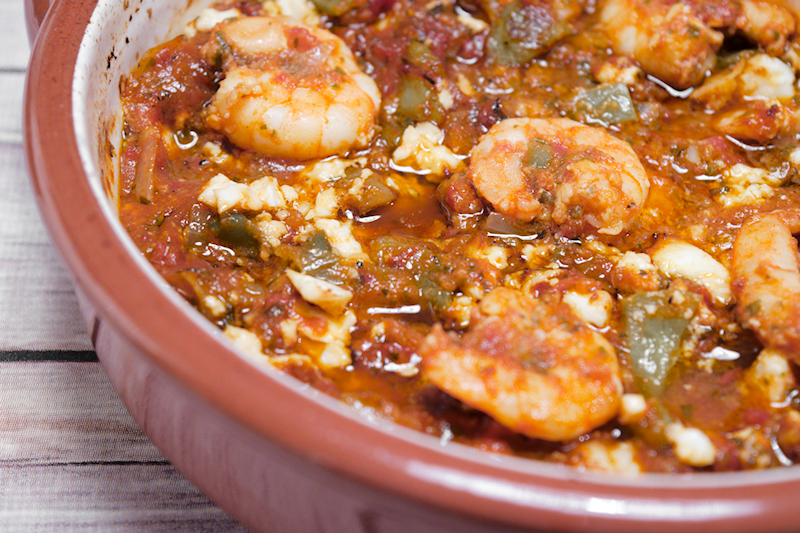 When it comes to seafood, Greek cuisine simply excels! 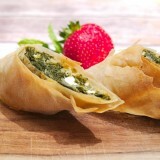 As a county which is surrounded by the sea, the Greeks have used its resources to feed themselves for centuries. Naturally, they have developed authentic and delicious recipes by combining local products with fresh seafood. There is nothing (I repeat: nothing!) more pleasurable than sitting in a tavern by the sea and eating fresh seafood with a glass of Ouzo. One of the delicacies you can find is “Garides Saganaki”, which is shrimps in a rich tomato sauce topped with Feta cheese. “Saganaki” is a word that describes something that is cooked in a frying pan. Another famous dish is the Cheese Saganaki, which is fried salty cheese covered with flour and served with squeezed lemon on top. Oh…I am drooling just by writing about it! Garides Saganaki is usually served as an appetizer and easily helps you to drink your first sips of wine or Ouzo. 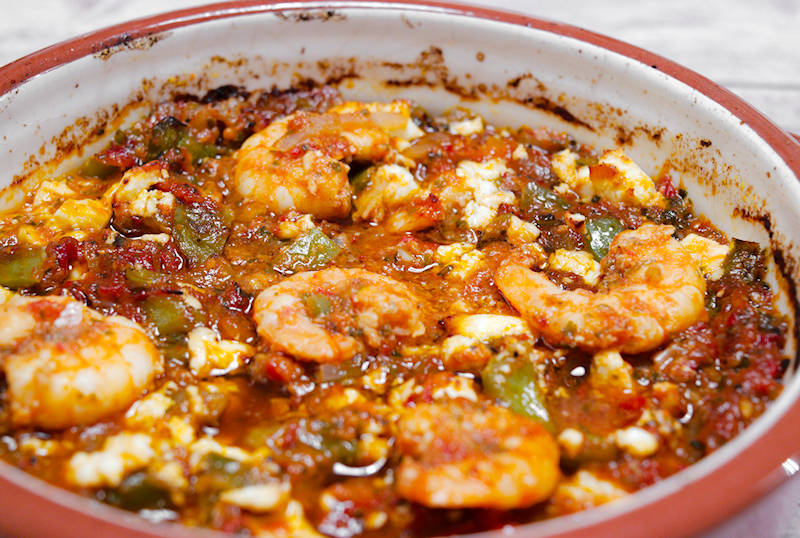 Don’t be scared by the combination of cheese (Feta) and seafood, they actually blend very well together. They key is the addition of a couple of shots of Ouzo or another anise-based liqueur to the sauce. The aroma is beyond any kind of description. In case you have any leftovers (which you won’t), you can make some rice or spaghetti and use the Garides Saganaki as a sauce. You will thank me later! A fast but delicious Greek appetizer with shrimps in tomato sauce topped with Feta. It's the famous Garides Saganaki. 2 shots of Ouzo or another anise-based liqueur. 100 gr (3.5 oz) of Feta cheese crumbled. Add the tomatoes, garlic, parsley and tomato paste in a food processor and create a coarse paste. Add the olive oil in a large frying pan on medium heat. Add the onion and green pepper and cook until they start softening. Add the tomato mixture from the processor, paprika, oregano, Ouzo and season with salt and pepper. Give it a good stir, lower the heat to low and let the sauce thickens (for about 10 minutes). 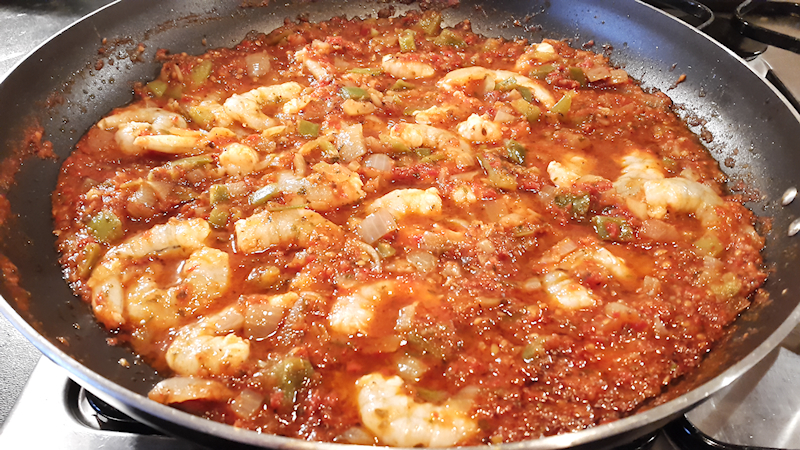 Add the shrimps in the pan, stir well and let them cook for a couple of minutes. 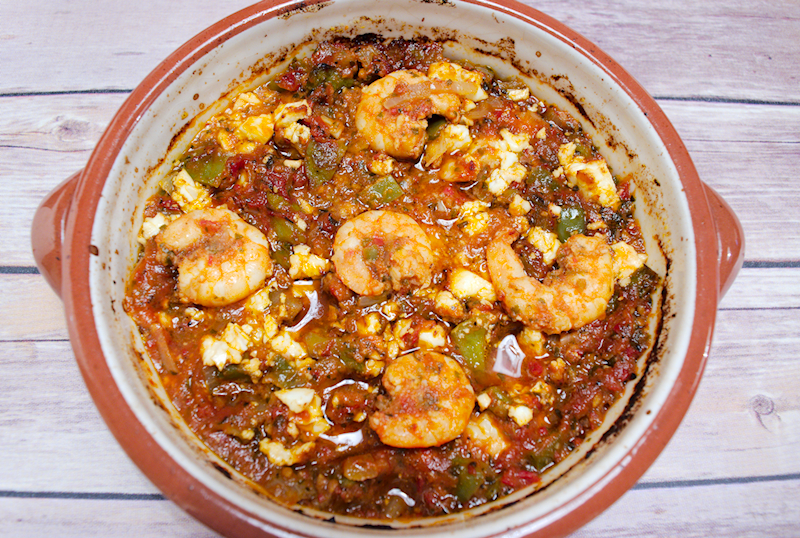 Transfer the shrimps with the sauce to a medium tray, top it with the crumbled Feta and cook it in the oven for 5-10 minutes until the Feta starts getting brown. Enjoy your Garides Saganaki with fresh bread and a glass of white wine or Ouzo.